Spinning reels are probably the most valuable and versatile piece of equipment that you could have on your boat when you’re out fishing. Not only do they work for both freshwater and saltwater applications, but you can use them to catch bass and panfish with equal ease. We get that shopping for a new spinning reel is not as easy as it once was, which is why we’ve put together a helpful guide for you on how to find the best spinning reels for the money. But first, let’s take a look at just some of the benefits that come with using spinning reels. 1 Why Use Spinning Reels? It’s great for casting light lure at long distances: With a spinning reel, your lightweight lure will go much further than if you were using a baitcasting reel for example. Sure, the latter might provide better control when you’re using heavier lures, but if you’re out there using a near-weightless ¼ ounce lure, then you’ll want something that’s easy to control, and that’s what spinning reels provide. Easy casting: Spinning reels are often recommended for novice anglers because they’re incredibly simple and easy to cast with. With only the weight of the fishing line to worry about, casting becomes effortless. No backlash: Thanks to the fixed spool featured on spinning reels, you can confidently break out your reels in windy weather conditions without worrying about getting a bird’s nest or backlash, because there is no resistance like you would find with a baitcasting reel. Ambidextrous: The spinning reel is a no-fuss piece of equipment in that it’s comfortable to use for both left and right-handed anglers. Commonly used for smaller fish: Spinning reels are ideal for use in catching smaller freshwater fish, as they don’t generally create a tremendous drag. However, the spinning reel still allows you to adjust the drag (which is easily accessible) if you need to as well so that you can angle for larger fish. Whether you’re buying an expensive name brand reel or an affordable one, there are some essential elements that you need to look out for when shopping for it to make sure that you’re getting a good deal. Here are a few features that we think are quite important. The distance which your spool allows you to reach when you make a cast can make or break your fishing expedition. That’s because the further you cast the more fish that you can reach. So, a spool that’s designed to allow for a longer cast on your spinning reel can go a long way to ensuring that you cover longer distances on the water to reach unsuspecting fish. Ideally, you want your fishing line to lie flat and even on the spinning reel with no lumps or bulges visible. Also, avoid spinning reels that come with shims, as that’s usually a sign of poor design and will most probably cause you problems when it comes time to load your fishing line. Remember, you want your line to be perfectly straight so that it’s easier for you to cast for longer distances without worrying about lumps or snags forming. Aluminum is often the best material from which to make spools because it doesn’t crack like graphite for example, which can give out on you at any moment. Spools that are designed with a braided line in mind are usually the most versatile and can work with any line. It’s also important to look out for the number of bearings contained within the reel. The more bearings there are, the better. 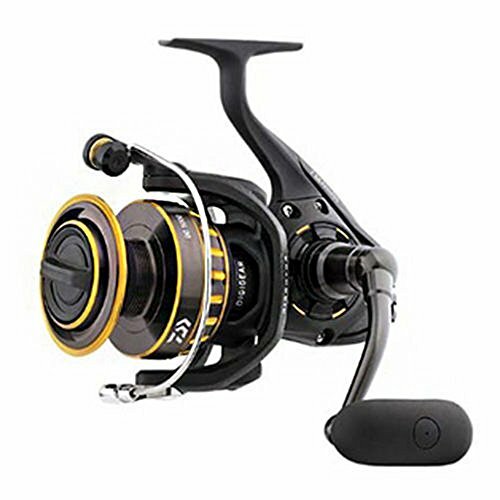 However, it won’t help to have a spinning reel with lots of bearings if they’re not good quality, so we highly recommend purchasing a spinning reel that contains ceramic or stainless steel ball bearings. You want your reel to have a comfortable handle as that’ll make your time on the water that much more pleasant, and by far the most comfortable materials are usually EVA and cork. For best results, we recommend a fast gear ratio of 5.2:1, as it usually works for most situations, and the average is usually something like 6.2:1. If your spinning reel starts to wobble as you start working with it, then it’ll give you trouble with bird’s nests, and poor retrieve when you’re on the water. So what you’re looking for is a solid reel with zero wobbles. The anti-reverse function helps to keep the handle on track while the drag is working to reel the fish in. 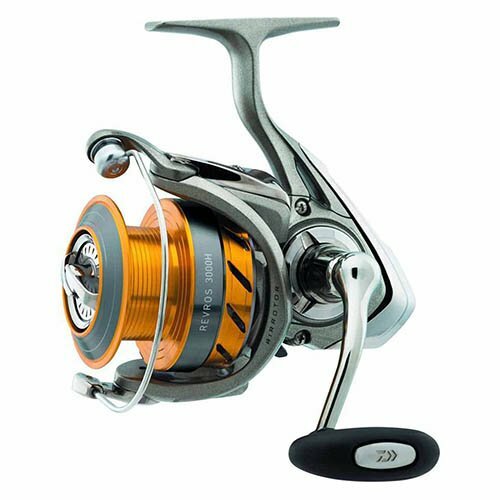 Spinning reels usually feature a frame that’s either made from graphite or aluminum, and each has its pros and cons. For example, graphite is naturally resistant to corrosion, lightweight and really easy to handle. Aluminium, on the other hand, is much stronger in comparison and also much more durable. To get the best of both worlds, we’d recommend that you opt for a magnesium frame, as it’s lightweight, durable and corrosion resistant. A carbon fiber drag system is ideal because it’s easy to adjust, it’s not fussy when it comes to maintenance, and it’s anti-slip. This well-made Penn Fierce Spinning Reel is made to last with full metal construction on the frame and the side plates. It also comes with four stainless steel ball bearings plus one extra, and this is in addition to its instant anti-reverse bearing feature. For optimal torque, Penn Fierce made sure that it has a Techno-balanced rotor, whereas the Superline spool features a braid grip which makes it versatile as well. This low-profile reel from Okuma comes with 8 ball bearings, an instant anti-reverse roller bearing, and a high-tech Elliptical gearing system. It’s beautifully designed with a machined aluminum spool that works just as well with braided as it does with mono. 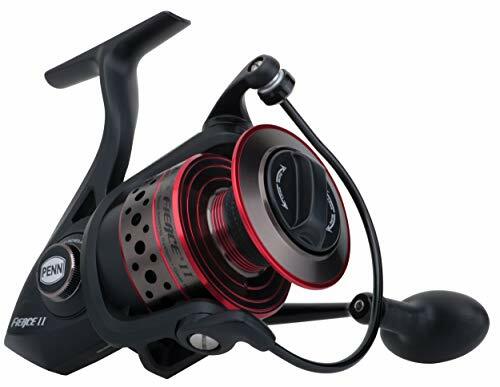 Also, with its Okuma RESII computer balancing system, you’re unlikely to experience any wobble when using this reel, and it has a gear ratio of 5.0:1 to boot. 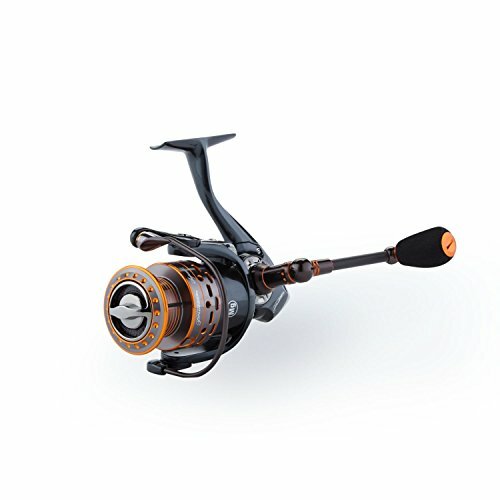 Thanks to its unique magnesium frame, this spinning reel is ultra-lightweight and is complemented by an equally light carbon handle. The sealed carbon drag is buttery smooth and makes it that much easier for one to reel in those difficult fish, and it’s easy to maintain on top of that. Another great feature of this reel is its comfortable EVA knob which is placed on a carbon handle. The spool is versatile enough to use mono as well as braid with equal efficiency. As such, this reel is incredibly versatile, and if you buy it while you’re still starting out, you’ll still be able to use it in different conditions and for different species, as you mature as an angler. Often recommended for freshwater applications, the BG spinning reel range from Daiwa features a dynamic cut aluminum ABS spool, which also happens to be braid-ready and resistant to corrosion and scratches. The ABS spool also enables one to cast for longer distances with less effort on your part. 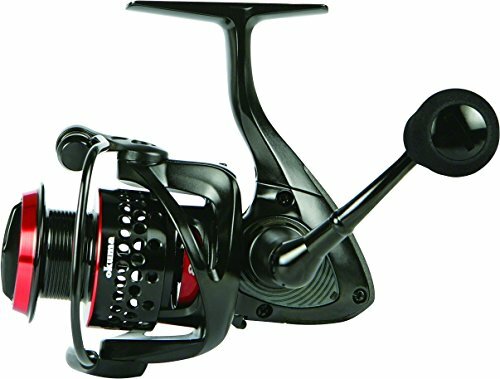 The screw-in handle makes for better control of the reel under challenging situations, while the high-tech oversized digi-gear system gives you more casting power and better torque. The air rotor means that this reel is incredibly light yet durable as well. With its sleek design and corrosion-resistant composite frame, you’d never guess that this spinning reel retails for just under $50. It packs quite a punch, with an 8 bearing system and an ABS aluminum spool which is corrosion and scratch resistant as well. Not only is it wobble–free but it casts smooth and long, and it’s suitable to use in catching both large and small fish, regardless of the lure. When searching for a spinning reel, it’s important to look out for key features like an aluminum spool, a fair amount of bearings, and the versatility to work with braided, mono and fluoro lines alike without giving you problems. The Okuma Ceymar Lightweight Spinning Reel is not only budget-friendly, but it fits these criteria perfectly. On top of that, it has an impressive gear ratio of 5.0:1, a comfortable EVA handle knob, and a lightweight yet solid build. Compared to the other models that we featured in this article, the Okuma Ceymar offers excellent value for money, and it’s made to last too.